Serving the best of the best Mexican food in Delano and all of Wichita in a great, classy atmosphere! A Fresh Take on Mexican! 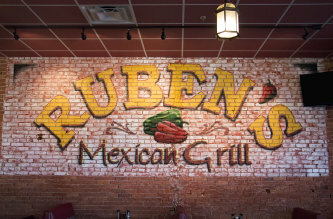 Ruben's Mexican Grill in Delano is the place to go when you're in the mood for the freshest, lightest Mexican food in Wichita served in a great atmosphere. Our chefs take great pride in creating beautiful dishes full of flavor. At Ruben's, you'll find great service in a relaxed atmosphere. Located right in the heart of the Delano district on Douglas, we're an easy drive from anywhere in Wichita but especially convenient to Downtown and Old Town. We have daily lunch specials and happy hour specials, so stop by for lunch or a relaxing drink after work! You get free chips and salsa with any food or drink order. We have a range of domestic and import bottles, signature mixed drinks and margaritas, and you've got to try our Tuacarita pitchers! Vegetarian and gluten-free options are available, and if you want something you don't see on the menu, just ask! Our chefs will be happy to make something to suit you. We use fresh ingredients that have never been frozen – it's Mexican food like you've never had before! Rent our restaurant for birthday, Christmas & holiday, anniversary, and office parties for up to 70 people! We're also happy to host your wedding reception or rehearsal dinner, and we cater any size of party – from a family get-together to events with several hundred people.